You all must know by now that we at CB-Net love a good, modern classic. And we like them even better when they are a little bit left-field or unloved, as that means a bargain. Sadly, in the world that is the ‘big retro’: ‘bargain’ seems to be a fast-disappearing word! Take the Honda CB1300 for example: if you read the press reports from the time it was launched in the UK ‘properly’ (2003) it kicked the arse of its peers. The air-cooled Yamaha XJR1300 was too old and too slow, the Suzuki GSX1400S had wibbly-wobbly/lardy handling and even the mighty Kawasaki ZRX1200R just didn’t have enough in the armoury to take on the Honda head-to-head. Today look at all these bikes and they hold strong residual values on the used market: people want big retros and today we want to make a case for the Honda. First, let’s head back in time and look at 1993’s ‘Big-1’. This was a late-1993/1994-year model powered by a CBR1000 motor. The name was (thankfully) soon dropped as the rumour was that ‘Big-1’ was a registered trade mark of an American brand of toilet cleaner: we kid you not! The next name ‘Super Four’ sounded much better, but even still, it failed to sell in the numbers Honda UK hoped, despite it being a well put together ‘UJM’. Why didn’t it sell? Well, let’s look at the price. In 1994 the retail for a Big-1 was £7695. A year later it was £8295! For comparison the FireBlade of the time was only £999 more… Move on to today and you can easily pay just £2000 for a mid-to-late 90s Blade, while – if you can find one – the ‘Big-1’ has the last laugh on the RR by being at least a grand dearer as a used buy… Little surprise then that the ‘Big-1/Super Four’ was deleted from the UK Honda showrooms by 1997. 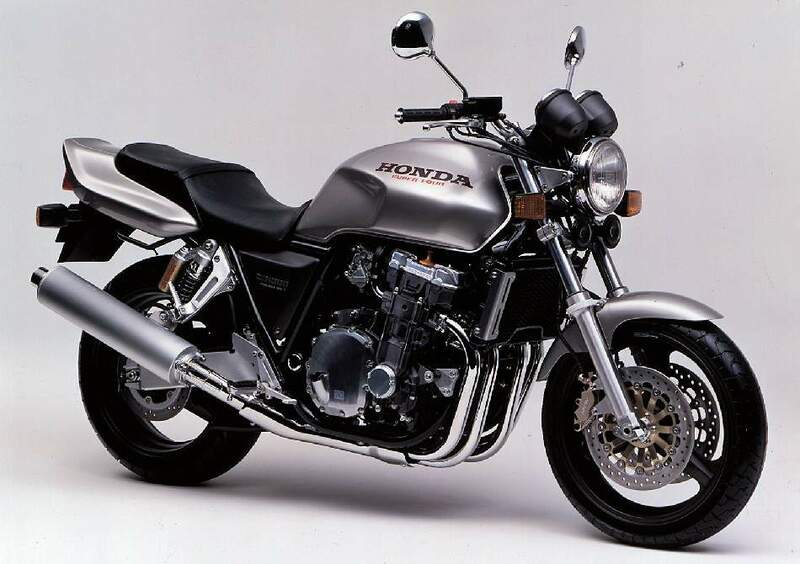 We over here in the UK waited until 2003 for the bike’s replacement, but the CB1300 itself had been around in Japan since 1998, using the motor from the VMAX-clone X4, which had a popular cult following in Japan. 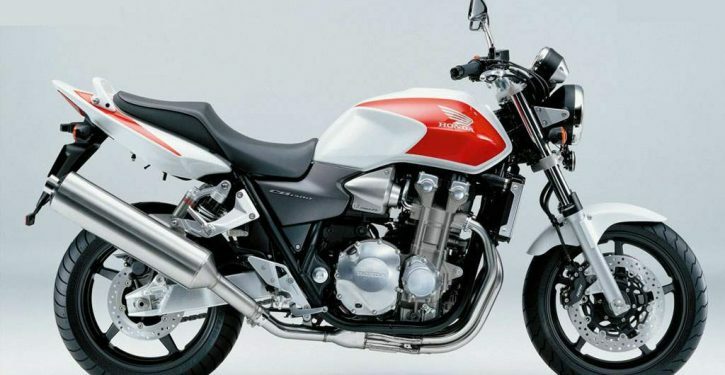 The CB1300 even cleverly copied the colour schemes from popular machines such as the CB900F’s ‘silver’ and CBX1000 colours. It was bang on the money when it came to nostalgia, but the bike itself would be updated by the time we got it in the early Noughties. On launch, the 2003 CB1300 was good: very good. In terms of outright performance it trounced its rivals. OK, so some may have had more power than the Honda’s 115bhp (Kawasaki ZRX) but the instant grunt from the big 1284cc lump was not to be ignored, while Honda’s chassis engineers had done a brilliant job with the handling, blowing the competition away and hiding the CB’s 224 kilos with aplomb thanks in part to the Showa suspension and Nissin brakes. Best of all was the price: around £6700 on the ruddy road. Honda would refine the CB still further in 2005 with the addition of a half-faired ‘S’ model (known as the Super Bol D’Or in some markets) and the option of ABS braking. Despite the original’s great performance and price, the competition did very well against the big CB. Yamaha’s XJR had its beginnings firmly rooted in the old FJ1100 and 1200 and it was actually air-cooled, which made it a ‘proper’ old bike. Kawasaki’s 1200R – meanwhile – looked like an Eddie Lawson replica and (even if the motor was more revvy than the Honda) for many that was enough. Suzuki’s GSX however, lacked that certain something: perhaps they should have brought out a bikini-fairing version to look like a GS1000S? Being a Honda, it was also fairly problem-free. The only issues were that the bike was thirsty (Power Commanders help here) and some owners reported gearbox issues, or an electrical problem that could lead to engines cutting out or lights going off. Also, some owners felt that the bike was a bit ‘vibey’. Some of this was sorted when engine timing and fuel-injection settings were changed for 2005. Despite its naked image, it also had practicality: the analogue clocks hid two LCD displays which held two trips, time, date, ambient air temp, stopwatch and fuel gauge. From 2005, the CB1300 had self-illuminating dials with trips, total trip meter, count-down trip, distance travelled, engine temp, stopwatch, ambient temp as well as date and time and a date reminder! Strewth! Not many cars could boast that! If there was an issue for some riders it was this: sheer size! Honda, as always, listened and for 2005 the bike was mildly re-engineered with slimmer side-panels to shorter riders touch the ground. Honda later released a scalloped seat which took around 30mm off the seat height. Riding the bike was grunt-laden fun. The motor redlines at just 9000rpm, and with a solid 86lb-ft claimed kicking in at just 6000rpm, the CB1300 gives you a big kick up the bum and this was a bum that didn’t look ‘big in this’ or feel heavy in the chassis department. Yup, you could really hustle this Honda. It was a stylish bike that looked good, went brilliantly and had lots of nice touches. Suspension: Front: 43mm telescopic cartridge forks adjustable for pre-load only. Rear: Twin Showa piggyback reservoir shocks adjustable for rebound and pre-load only.